Loaded Bighorn Package! Navigation, Heated Seats, 20'' Wheels, One Owner, Perfect Autocheck! WOW What a Truck! LOW Mile Loaded Big Horn Package! One Owner! Perfect Autocheck! No Accidents! Four Door Crew Cab 4x4! Factory Navigation System! Back Up Camera! Front & Rear Back Up Sensors, Heated Cloth Seats, Power Seat, V-8 5.7 Ltr, HEMI! 4 Wheel Drive, 20'' Factory Chrome Wheels, 3 Year/36,000 Mile Bumper to Bumper & 5 Year/60,000 Mile Drivetrain Warranty, Sirius Radio, Alpine Stereo w/ Aux/Usb Ports, Bluetooth, Traction Control, Dual Front, Curtain & Side Airbags, Fog Lights, Heated Steering Wheel, Spray In Bedliner, Step Bars, Remote Keyless Entry & Start, Trailer Tow Package, Power Sliding Rear Window, Like New inside & out! Why Buy New!? We are Family Owned & Operated in the Same Location for Over 40 Years! We Pride Ourselves on No Pressure or Hassle Sales & We Don't call you at home. Will be the Easiest buying Experience ever! CHECK OUT OUR FULL INVENTORY with Over 25 PICTURES, DESCRIPTIONS & PRICES On each Vehicle on our WEBSITE at www.goldenautosales.com or call us at 1-815-234-5546. 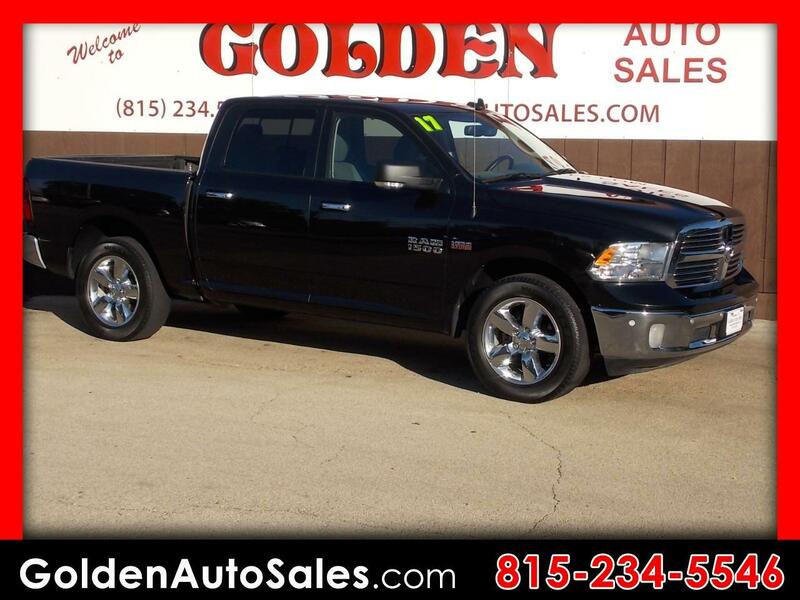 Visit Golden Auto Sales online at www.goldenautosales.com to see more pictures of this vehicle or call us at 815-234-5546 today to schedule your test drive.